For the 39th year in a row the largest celebration of firearms in America takes place in Las Vegas Jan. 17, bringing together law enforcement agencies, gun dealers and sportsmen all under one roof for the Shooting, Hunting and Outdoor Trade Show 2017. With 13 acres of exhibitor space and 12.5 miles of aisles at the Sands Expo Center, SHOT Show 2017 is the place to be if you are a gun lover. More than 60,000 attendees can check out everything from the latest hunting rifles, to Glocks and more ARs than you could ever imagine. This is the premier firearm convention in the world. At this year’s SHOT Show the atmosphere should likely be more festive than last year, when many in attendance lamented the stringent federal gun control laws that were being pushed by Democrats. But this year, with the election of Donald Trump, gun enthusiasts have something to cheer about. What exactly will become of their newfound advocate will yet be seen. President-elect Trump has already signaled his willingness to break ranks with the NRA on the criminal background check system, stating he believed anyone on the terrorist watch list should not be allowed to own a guy. In the past the NRA has opposed such measures and others like it on the grounds that it creates a slippery slope. Politics aside, the 2017 SHOT Show promises some noteworthy new looks at offering from major gun manufacturers such as Sig Sauer, Winchester, Remington and Kalashnikov USA. Today the firearms and ammunition industry represented $6.7 billion worth of business in 2015. The total economic impact of the industry is more than $49 billion, which supports nearly 288,000 jobs, according to the National Shooting Sports Foundation, which puts on the trade show. 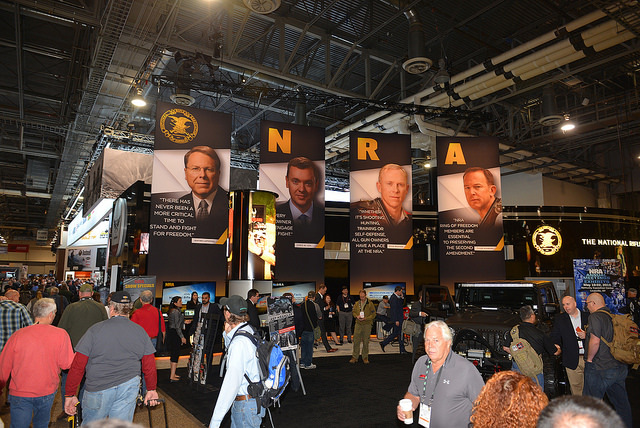 Law enforcement has increasingly accounted for a larger share of the SHOT Show convention space, illustrating a larger trend in the market. At this year’s show, law enforcement-oriented dealers cover some 170,000 square feet of exhibitor space. You can follow our ongoing coverage of SHOT Show 2017 from Las Vegas through our main show page here.